Heroes, Heroines, and History: IN MY BACKYARD? A CIVIL WAR POW CAMP? IN MY BACKYARD? A CIVIL WAR POW CAMP? You have to be kidding! A prisoner of war camp? In Tyler, Texas? In my backyard? Well ... almost. My husband and I ran a Christian Camp and Conference Center north of Tyler, Texas, for about ten years. Tyler was the town where we went to buy groceries, to shop, to go out to eat, for dance classes. It was the hub of our socializing and shopping. Imagine my shock when in my research for my Civil War novel set in Texas, His Steadfast Love, I discovered that a Civil War POW camp for Union soldiers was on the loop around the city, and I passed it every time I traveled to town for whatever reason. Who knew? I had to go see it for myself. About 5000 prisoners passed through the prison from 1862-1865. It was the largest POW camp for either side west of the Mississippi. The prisoners themselves had to construct their shelters. Some simply dug holes out of the side of the hill and built a shelter there. With the abundance of natural supplies, many of the men built small little cabins which they called "shebangs." Folk lore claims this is the origin of the word. Because of the relatively mild winters in the East Texas piney woods, these shelters were sufficient for housing of the men. A stream ran through the middle of the camp providing fresh water most of the time. The prisoners were fed basically what the guards ate: corn meal, beans, bacon and occasionally beef. Frequent attempts at escape were made, but because of the long distance to the Union front, few were successful. Dogs were used to track down the escapees which seemed abominable to the soldiers that dogs would be used against white men. Dogs were used regularly to track down slaves. A garbage cart rumbled through the camp on a regular basis, which proved to be the most successful means of escape. Prisoners would hide under the trash and ride out. Of course, soon that trash run was eventually suspended. Those escapees returned were severely disciplined. In His Steadfast Love the hero, Captain Kent Littlefield, is taken prisoner in the Red River Campaign, and executes his escape by riding out in the garbage cart. There was no hospital, but a doctor had been taken prisoner and so the Yankees set up their own clinic. Camp Ford had the fewest deaths of any POW camp in the Civil War at 280 out of nearly 5000 men. They boiled their clothing daily to try to keep the lice infestation at bay. A granite marker was erected after the end of the war to mark the spot. It might pay you to look around your area. Who knows what historical treasure you might find in your own "back yard!" Golden Keyes Parsons writes historical fiction, and is also a popular retreat/conference speaker. Her highly acclaimed Darkness to Light Series (Thomas Nelson Publishing) chronicled the journey of her French Huguenot ancestors in 17th century France. 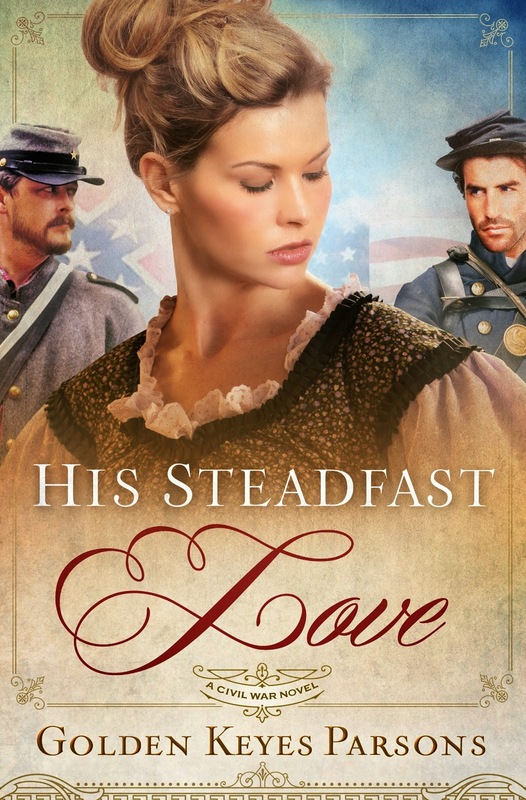 Her fourth novel, His Steadfast Love, is a Civil War novel set in Texas. Her latest release is a compilation of four novellas (WhiteFire Publishing) – a biblical fiction series entitled Hidden Faces, Portraits of Nameless Women in the Gospels. Golden lives in Waco, TX, with her husband, Blaine, where they enjoy their children, grandchildren and great-grandchildren and are avid sports fan of their alma mater, Baylor University. You can contact her at www.goldenkeyesparsons.com. What a cool find, Golden. If you were a prisoner, it sure would be nice to have a cozy, little cabin to live in vs. a hole in the ground. I wonder, though, were the prisoners allowed the use of axes and saws? Seems dangerous for the guards. Interesting post! Good question, Vickie. I'm not sure if they were allowed tools. Perhaps while closely guarded? I'll have to look that up. Yes, men, mostly officers, were crowded into the "shebangs." Very cramped. My name is really my name. "Keyes" was my maiden name, and as I didn't have a middle name, my parents always intended for me to use it as a such. However, I never did until I started speaking and writing professionally. Oh, good, Sharon! I would love to hear if your brother knew about it previously, and if they have visited it.